What you do and don't want is the 21st collection from the prestigious Creative Writing program at the University of Technology Sydney. "Selected Moments" are little excerpts of the 2007 Anthology What you do and don't want. I once said "The world is made of strings of energies. A brick and I are made of the same basic elements. The strings vibrate differently to form different particles." My husband stared at me, shaking his head, sighing, speechless. He did not speak to me for the rest of the evening, but he made me Masala Chai tea. James rocks in and out of the lights as he taps 2, 4 with his right foot. Normally jazz guys tap 1, 3, but not James. Mahogany light beams onto his hand. It mirrors his guitar mirrors his hand mirrors his guitar. A green light spills onto his face. He rocks in and out, in and out, in and out of mahogany and green. All the while tapping 2, 4. When we were ten, I cut off one of Anna's braids while she was sleeping. I don?t recall what she did or what she said but I remember how I felt. I remember thinking, So this is why our mother carries scissors in her apron. This is why she insists we grow our hair. She is waiting for us to treasure something so she can take it away. You grew up in the province, next to a rice field, precariously situated in a valley, with floods to quell the brightest hopes. Every year during the monsoonal season, you walked home from school with your bag on your head, your shoes slung over your shoulders, and water to your knees and heart. When the flood subsided, your father made you clean the chaos before you cleaned yourself. They tell me I molested my neighbour's son. I didn't do it. It's just plain wrong. Even if I was into kids big time, this one is just so ugly. helpless as their wives are dragged away by the throat. Therese Breen promises her first novel by December 2007. Her interests are ale, the supernatural, and thriving as a technophobe in a world of bytes and flops. She's terribly fond of family and friends. They support her acquisition of a castle with a moat full of mermaids. She believes in tattooed angels. They set her free. Armed with years of copywriting experience and a thesis examining the uneasy relationship between history and fiction, Cameron Brockmann has set off to explore unknown lands, penning epic short stories while gazing out of aeroplane windows. Having learnt to write fiction in a tower he can now write only at altitude, and is currently trapped in a skyscraper in Shanghai trying to find the elevator. Clint Caward's work has appeared in Quadrant and The Australian. He's received an Australian Society of Authors mentorship and been shortlisted for the Varuna Awards for Manuscript Development. He is currently completing a novel for a Master of Arts in Writing (Research). Dan Collins is a recovering Communications graduate. He works at a second-hand bookstore and plays bass in a band called Walrus. His classic short story, The Spooky Old Ghost (Northbridge Primary School Press), was published to rapturous acclaim in 1988. Reg Domingo is a freelance writer and journalist, specialising in GLBT issues and literature. His work regularly appears in SX News and MCV (Melbourne Community Voice). He is currently the editor of gay lifestyle magazine AX National. Joanna Egan is studying Honours in Creative Writing. She resides in Sydney's inner west, is passionate about photography and enjoys travelling. She's interested in the creative capacities of non-fiction writing and would like to explore these further. Lauren Finger is completing her Master of Arts in Creative Writing. She is an editor at Allen & Unwin book publishers, a columnist for Arts Hub Australia and a previous editor of the UTS Anthology. She spends far too much time thinking. Trish FitzSimons is a documentary filmmaker and screen production lecturer at Griffith University, Brisbane. Her Doctorate of Creative Arts at UTS considers the "voice" of documentary and of other cultural forms. The human relationship to water underlies much of her current work. Zahid Gamieldien is a fifth year Writing and Law student at UTS. He has no political affiliations and doesn't feel like he belongs anywhere except with his partner, Kirsty, and his family. Tiffany Hambley is studying for her Master of Arts in Creative Writing at UTS. Katherine Keefe moved from Perth to Sydney six years ago. She has worked in two bookshops, a sushi bar, a museum, a café, two libraries, a pub, a body jewellery wholesaler, three restaurants, an art gallery, a tattoo studio, a clothing store, a show-bag stand, two design studios, her bedroom, an outdoor cinema, two swimming pools and a theatre. Tess Kerbel is a poet, playwright and novelist. Below the White Oak is an extract from the novel she is currently working on, which concerns the staggering number of unexplained arrests and disappearances in South Africa in the late 1980s. Jaki Leigh grew up in Broke in the Hunter Valley. There wasn't much to do so she read and wrote a lot. She completed a UTS Master of Arts in Creative Writing in 2006. She's writing a novel but doesn't like to talk about it. Isabelle Li was born in China. She now lives in Sydney with her husband and her in-laws. She works for a telecommunication company and goes to work by bus. She carries with her a pocket dictionary. She reads slowly and collects words like some women do jewellery. Eleanor Limprecht's two grandmothers, Lorraine and Marge, will be sharing this anthology with all of their friends. As embarrassing as she may find this, had it not been for their encouragement, Eleanor would probably still be delivering pizzas. Talia Linz is currently re-treading the boards of university, doing a Master of Arts in Creative Writing at UTS. She previously graduated from Theatre Nepean where she trained in acting and writing for performance. For now, she plans to go where life beckons, and write about it. Bonita Mason is a WA-based writer who works for Aboriginal organisations and is a part-time journalism lecturer. She is enrolled in a Master of Arts at UTS and won a Walkley and the George Munster award for freelance journalism in 1997. Bronwen Morrison completed a Graduate Diploma in Writing at UTS in 2006. Her interests include poetry, genealogy, ice-skating and travel. She is currently working on a family tree with her 91-year-old grandfather, and is studying graduate medicine with the aim of becoming a rural GP. Somewhere in the midst of her writing degree Emma Mulholland got lost in Africa. Driving deep into a place that could have been nowhere, she started thinking about pot plants and air fresheners and all the funny things people do to fill up space. It's a thought that's been stuck in her writing ever since. Andy Porter has a Master of Arts in Professional Writing from UTS and recently launched his own independent publishing venture. Jana Roose was the only person in Grade Three to not receive her pen licence or running-writing licence. Knowing every conjoined pen stroke could incriminate her makes life very, very exciting. Mark Rossiter is undertaking a Master of Arts in Writing (Research) at UTS. Anne Rutherford is a film scholar who has written on affect, embodiment and the nature of mimetic experience. This is her first work that explores these issues in fictional form. Joel Scott is at the rump-end of his writing course, though he’s never called himself a writer and never will. He’d rather be described as an ambassador for allergy sufferers worldwide, or a wannabe Basque revolutionary. Joel’s linguistic interests are currently focused on the interstitial spaces of translation and speech. Pat Skinner is studying for a Doctor of Creative Arts at UTS. Jon Steiner grew up in Washington, DC. He has been a taxi driver in Texas, an office temp in New York City and is now a film librarian. He is currently working on a screenplay about an old Portuguese guy. Ashleigh Synnott is 23 years old and has a degree in journalism. Sam Twyford-Moore's writing and criticism has appeared in magazines such as The Big Issue, Voiceworks and, more frequently, The Brag. Australia's leading literary journal, Meanjin, published his memoir, On Returning Home, one hundred pages behind Robert Forster. He is currently working on a novel and an essay on the songwriting of the late David McComb for a Melbourne university journal. Conrad Walters, a career journalist, is studying for his Master of Arts in Creative Writing. My Sunbeam is his first published piece of fiction. Claire Zorn is currently studying for a Postgraduate Diploma in Writing. The Cellophane Man is her first published work. Claire works in publishing and is currently finishing her first novel for young adult readers. Tricia Barton delights in the MA Writing at UTS. 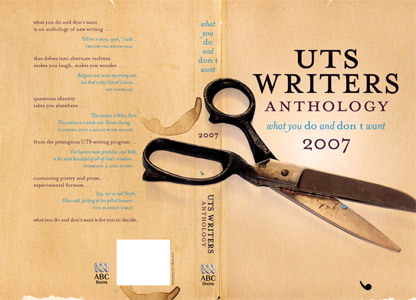 Publications include poetry in a variety of journals including Southerly, and literary criticism and book reviews on Australian women’s poetry in critical anthologies and literary journals. She hopes one day to earn enough from her writing to pursue her abiding passion full-time. Conrad Walters has worked in newspapers and online media in Australia and the United States for more than 25 years. He currently works at The Sydney Morning Herald where, among his many curious roles, he reviews novels. Jo Chipperfield is a freelance writer and editor. After four years of moderate success, she completed a UTS Graduate Certificate in Editing and Publishing in 2006, and just got her first non-fiction gig with a major publisher. Briony Stocker has lived in Australia for five years this May. She recently got her citizenship without having to know Don Bradman’s batting average. Eleanor Limprecht is completing a novel and a MA in Writing at UTS while working as a sub-editor and freelance journalist. She lives in Glebe with her husband, a kelpie and two chickens; her first child is due in May. Bryant George is a Sydney-based writer and critic. By day he can mostly be found tracking changes in consumer culture. By night he can mostly be found flicking through the pages of Vanity Fair when he should be working on his first novel. Mark Rossiter is a freelance editor and manuscript appraiser. He joined the anthology committee to learn more about the book business, from blank page to bookshop, as well as to discover how pieces are selected for publication. The third post under 'Comments' section after article. This book is published by ABC books and Allen & Unwin. © Copyright UTS - CRICOS Provider No: 00099F - 16 April 2019 10:20 AM. The page is authorised by Dean, Faculty of Arts and Social Sciences.